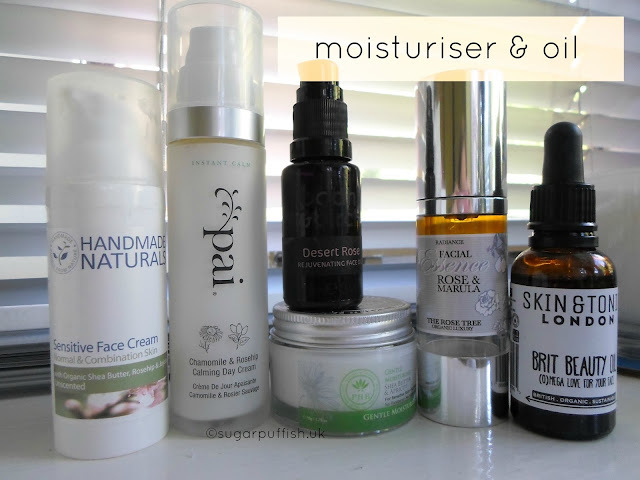 Back in December 2014, I shared with you my current facial skincare products. I thought it might be interesting to take another look into my beauty cabinet to see how things may have changed. As I have mentioned many times before my motto is always "cleanse, tone, moisturise" and I do this morning and evenings. I will switch around products depending on my mood but I generally don't have more than two cleansers or moisturise in rotation at one time. 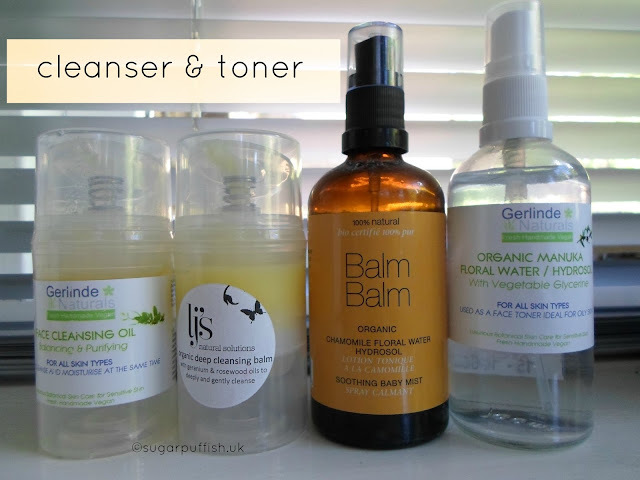 Cleansers - I've been rotating between Apricot Kernel Oil, Gerlinde Naturals* and Lj's Naturals. All three have simple ingredients with very little or no essential oils. Balms and oils are my favourite cleansers. I swear that too much water when cleansing leaves my skin irritated and dry, so a damp muslin cloth helps limit this feeling. Toners - You'll notice Balm Balm Chamomile Floral Water makes another appearance, in fact it is the same bottle. You'll be seeing it in an Empties post in coming months, sadly it's at the point of recommended expiry so we should part company. I had put it to one side whilst I was trialing other floral waters. I recently re-purchased manuka floral water and this time around I opted to buy from Gerlinde Naturals. Moisturisers - It's not the same bottle but I always have Pai Chamomile & Rosehip Calming Day Cream in my collection. I rely on this one when I need to soothe irritated skin. When I don't reach for Pai, I am currently trialling PHB Ethical Beauty Gentle Moisturiser and using up Handmade Naturals face cream. The latter I've had hanging around for a few months so I should work on finishing the bottle. Oils/Serums - I always have a stash of oils on the go, I rotate depending on my mood but I admit I reach for them less during the warmer months. I still have my bottle of Bodhi & Birch Desert Rose* and The Rose Tree Radiance Facial Essence Rose & Marula* but the new addition is Skin & Tonic Brit Beauty Oil*. So that folks is what I am currently using on my face. I'm unlikely to add any new products to my routine unless one of these runs out. Are any of the brands or products mentioned here favourites for you? I recently saw Gerlinde Naturals on Sophia's Choice and was intrigued by their products. This reminds me I need to dig out some Pai products I still haven't opened! Lovely routine! I hope to try Lj's Naturals and Bodhi & Birch. Thanks for the brand introduction to Gerlinde Naturals as well. They look like they have a few gems I'd like to try.